Red sauce, hot sauce, brown sauce and white sauce - whatever your dining habits most people have a preferred condiment. Most will choose tomato, BBQ and smoked sauces as their favorite but the world of condiments is full of variety. Just take a look at the many different sauces listed on this Taxonomy of Condiments from Stephen Wildish. 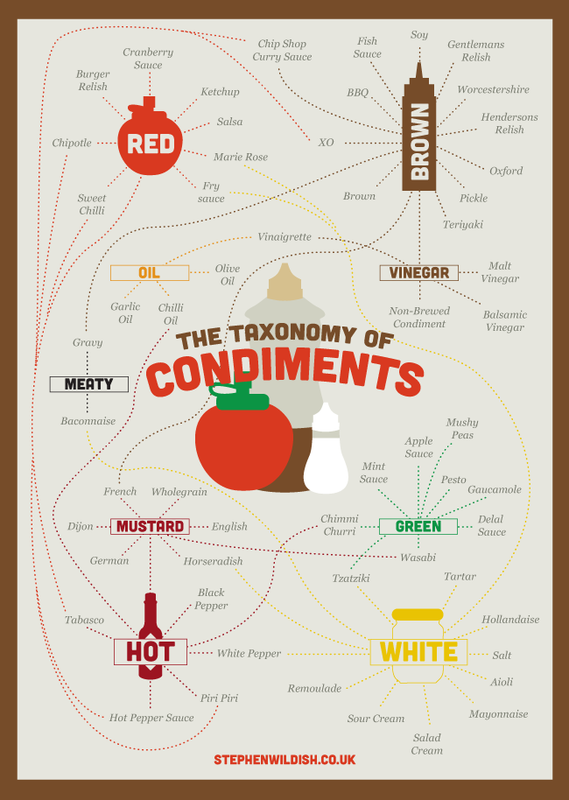 It sets out an extensive list of condiments grouped with their different sauce siblings. Green sauces = mint, wasabi and pesto. Red = sweet chili, cranberry and salsa. If you like to hone your knowledge of ingredients and the different ways in which they group then you'll surely love this tasty taxonomy.